I do not know if you are familiar with tele novellas but there was one that made rave at a time in Nigeria called”when you are mine” it was aired on A.I.T Yeap!! paloma and Diego inspired my career choice but before you judge me let me finish my story. As a child I have always been very inquisitive, I asked the most annoying questions but it was just due to my quest for knowledge. I remember one time in junior secondary school I sat with my best friend one night and asked questions like how does nail grow, is there hair in our brain and how does it grow and lots of ridiculous questions but he was patient enough to answer all my questions from science perspective even though I didn’t want science perspective. Looking back at that moment those questions were stupid but he was and is still the best. So back to the Diego and Paloma story, paloma moved from the village to the city and began working in the Public relations section of a company. What I loved about that part of the telenovella and probably the only part I remember was how she worked all night on presentations,did graphics and presented the next morning so eloquently and confidently. I was observing as a little girl and I asked my dad what course will I study to be like her and he replied saying public relations and advertsing which is a branch of mass communication in the University” and ever since that day there has been no looking back. Unlike a lot of Nigerian parents who discourage their children from studying courses like creative arts, music, masscomm etc because they feel its not lucrative I have to say special thanks to my parents who didn’t discourage at any point but rather kept on pushing. 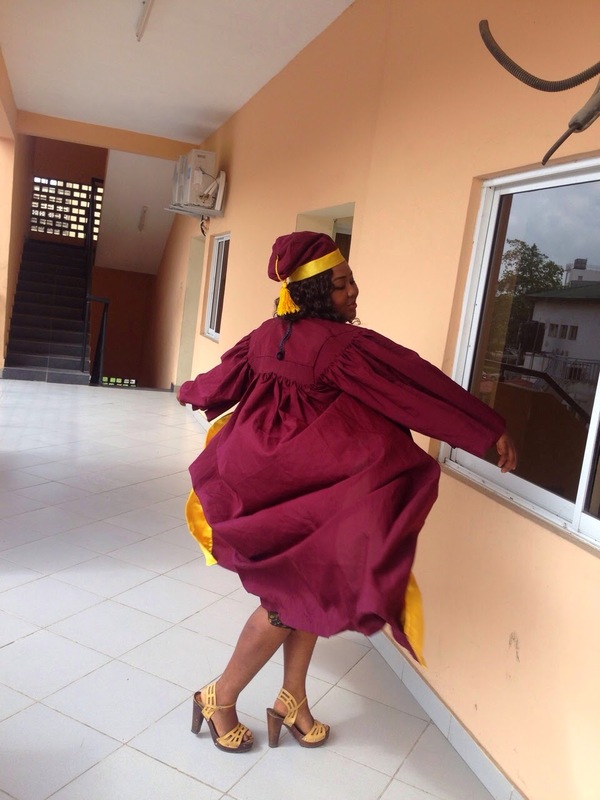 If you follow me on instagram, you would have gotten the gist that yesterday was my convocation ceremony….. Thank you for all the love and support, I’m super grateful. What next? Did I mention I finished with a second class uppers ( oya pop the bottles) , I’m currently preparing for NYSC camp. Damie, congratulations on your achievement. Hopefully, it will herald the start of more beautiful things in life. Best wishes as you prepare for service! Thank you Uju, I'll definitely check the link. I need all the resources I can get. Congrats again dear. We studied the same course Yaaaaay and same area of focus – PRAD. My inspiration (nt really an inspiration) was the fact that everyone called me a newscaster since I was little and I cud report issues as quick as possible. Even while in 100 level, I'd be the one my friends and colleagues would want to get first hand information from. Buh fortunately, broadcasting was nt my tin, I was more passionate abt public relations and advertising. So I'm tinking u got posted same state too. Hehe. I'm off to Lag camp next week. Where were u posted. Congrats hun, wishing you the best. Apparently I'm in Jos ooo.but we need to meet up soon, since we have a lot in common. It's better late than never. Thaks!!! !